Rent the Races —Saving Horse Racing One Hat at a Time By Annie Johnson, Antebellum Turf Times: Steve Haskin wrote recently that women will keep racing alive (Bravo, Steve! 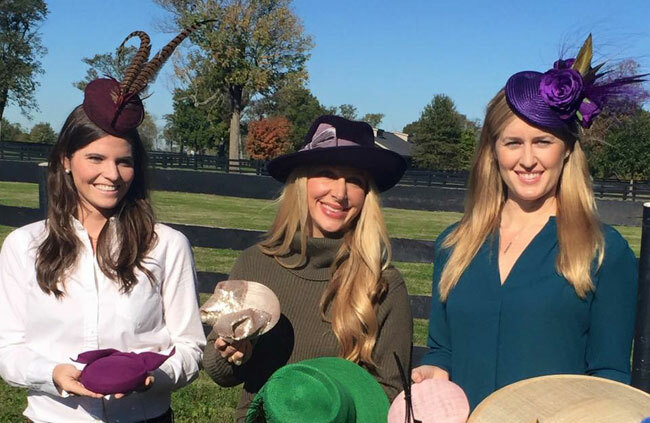 ), and Renttheraces.com, led by three Lexington ladies of the Thoroughbred industry, is breathing new life into race-day fashion by offering short-term rentals on hats and fascinators. Launched last September, Rent the Races is operated by partners Catherine Ladd Kenneally, who is married to trainer Eddie Kenneally and works at her family’s Cross Gate Gallery, a leader in sporting art; Kate Ryan, who is married to bloodstock agent Tom Ryan; and Mary Catherine White, who works for Mt. Brilliant Farm. And while the majority of their rentals to date have been local, Rent the Races continues to expand its clientele across the country, including some renters who travel internationally. The ladies strive to offer hats and fascinators that are high quality, fashion forward, and unique enough to stand out from what women might find available for purchase elsewhere, and the inventory consists of worldwide designers from England, Ireland and Australia as well as U.S.-based milliners. Some of the website’s most popular rentals include the Kelsey, an emerald green fascinator by Carol Kennelly; leopard-print fascinator Wishbone by Rachel Black; and the Purple Smartie fascinator by Sophie Hunter, with roses and macaw feathers. Renting the pieces is truly “a steal,” as they run as low as $20 for a four-day fascinator rental and start at $50 for hats, while the retail value of the most expensive pieces reaches more than $400. Clients can be fashionable without the long-term commitment, the high price tag that comes with buying pieces, or the need to wear an item multiple times to make a pricey purchase worthwhile. The rental process is simple too: items are returned using a pre-paid shipping label, and local clients have the opportunity to arrange for pick-up or can make appointments to try on pieces before renting. Even though the first Saturday in May is still a couple of months away, rentals can be reserved months in advance, and since they’re so affordable, customers can also consider donning hats and fascinators for the many Derby prep races taking place across the country this spring. The Rent the Races team is now in the midst of a social media campaign for feedback from customers on what they’d like to see in the store for new merchandise. “We will be adding some new inventory to make sure everyone has something they want to wear for Derby or Derby prep races,” said Mary Catherine. As the goal of Rent the Races is to make hats and fascinators affordable and available to women of all ages while encouraging, promoting and supporting the racing and Thoroughbred industry, a portion of each rental is allocated to the racing charity of the client’s choice. These include the Bluegrass Conservancy (which works to protect the Bluegrass Region of Kentucky through land conservation), the Permanently Disabled Jockeys Fund and Thoroughbred Aftercare Alliance. So if buying these race day accessories just isn’t in the budget, it’s Rent the Races to the rescue—women truly will keep racing alive! Visit the online shop at www.renttheraces.com, and follow on Facebook, Twitter, and Instagram. Annie Johnson is a freelance writer currently working on a book about antebellum Thoroughbred racing in New Orleans. Her work has appeared in American Racehorse and Deep South Magazine, and on her website antebellumturftimes.com, which features articles related to her research on the sport’s history. Follow Annie on Twitter at @AntebelTrfTimes. 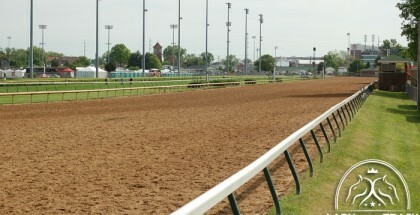 Launched last September, Rent the Races is operated by partners Mary Catherine White, who works for Mt. Brilliant Farm; Catherine Ladd Kenneally, who is married to trainer Eddie Kenneally and works at her family’s Cross Gate Gallery, a leader in sporting art; and Kate Ryan, who is married to bloodstock agent Tom Ryan.